This fluffy, moist, and RICH chocolate sheet cake piled high with fudgey chocolate buttercream is beyond easy to make but it will become a favorite! 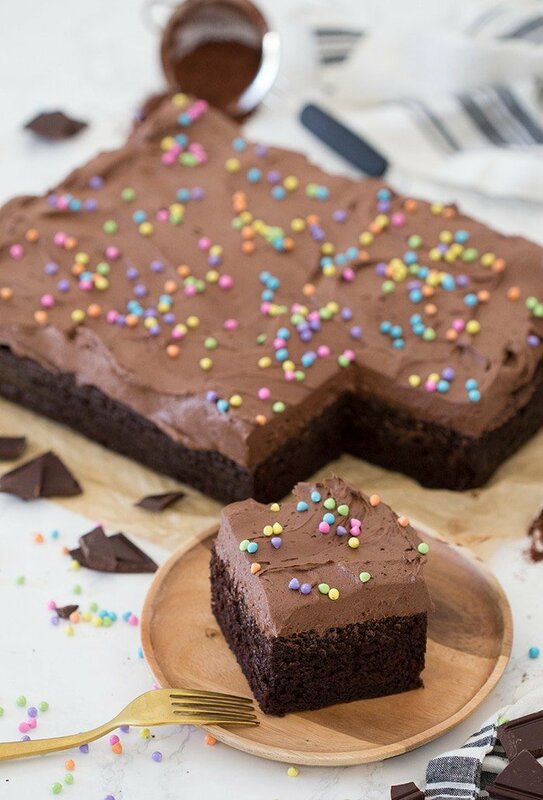 My easy chocolate sheet cake is basically perfect. So fluffy and FULL of chocolate flavor, without being oily and sad like so many store bought cakes. 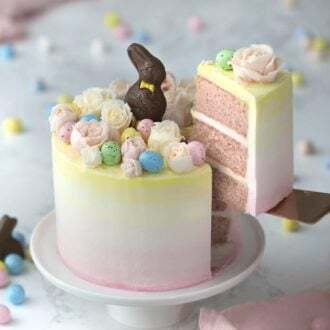 A nice dollop of fudge transforms this buttercream into something almost magical but if you don’t have any handy try adding in some ganache! There’s something so comforting about a sheet cake. It is totally low stress baking that delivers all the taste! If you’re substituting the fudge for a ganache just scald 1/4 cup of cream or milk and pour over an equal amount or semi or bittersweet chocolate chips (or chopped). Let it sit for a few minutes then whisk together. You can add more or less of this into the buttercream It’s really up to you! Use whole milk with a tablespoon of vinegar or lemon juice as a substitute for the buttermilk. Hate coffee? Just use warm water instead! A 9″ x 13″ pan will yield about 30 2″x2″ pieces. An 18” x 26″ pan will yield about 78 2″x2″ pieces. 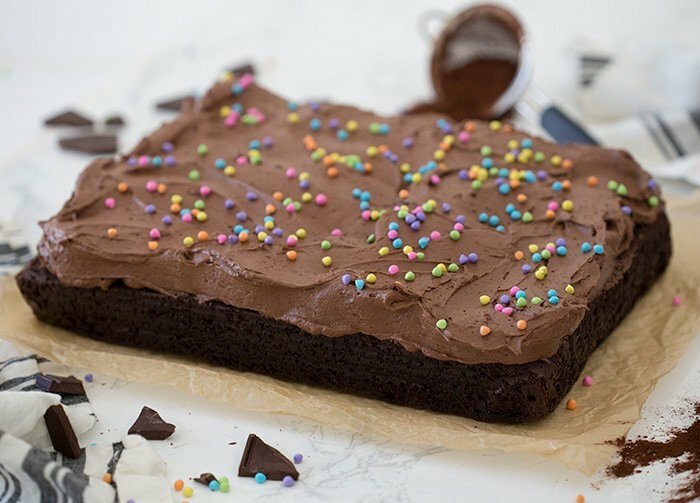 Can you freeze chocolate sheet cake? You can freeze a sheet cake for the ultimate make ahead treat. For best results freeze the cake unwrapped then once frozen, wrap well and store for up to 6 months. You may also want to freeze the cake and frosting separately. This way the moisture in the buttercream will not seep into the cake. 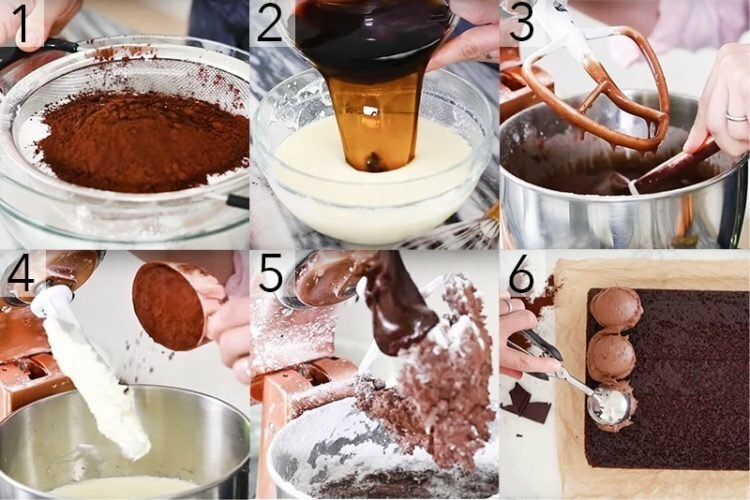 How do you make a chocolate sheet cake? 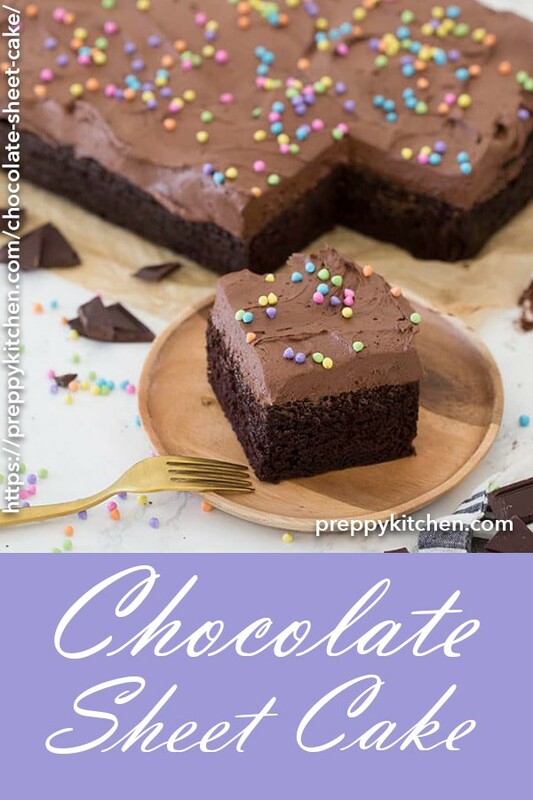 Preheat the oven to 350 degrees and add parchment paper to a sheet cake pan. Butter and flour the paper and sides. Sift the dry ingredients (including the sugar) together into the bowl of a stand mixer and give it a whisk to combine. Add the wet ingredients (vanilla, oil, coffee, eggs, buttermilk and sour cream) into a large bowl and whisk them together. Pour the wet ingredients in with the dry and whisk to combine. On level 2, mix for two minutes then pour the batter into the cake pan. Bake the cake for about 50 minutes or until a toothpick inserted in the center comes out clean. Allow time to cool then invert it onto a wire rack to cool fully. For the frosting; beat the butter in a stand mixer and add the cocoa powder in on a lower level. Combine confectioners sugar and salt then add the fudge in slowly. Mix until everything is incorporated. Time for the assembly; add the buttercream to the top of the cake with an ice cream scooper. Spread over with an offset spatula. 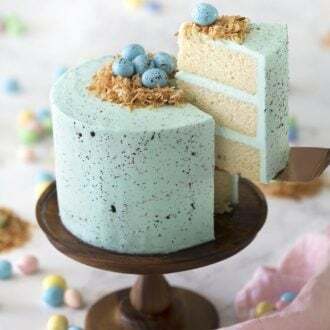 You can decorate the cake with sprinkles, chopped toasted nuts or shaved chocolate. Enjoy! A super rich, moist and FLUFFY chocolate cake topped with a decadent fudge buttercream. Add parchment paper to a sheet cake pan, butter and flour the paper and sides. Add the wet ingredients to the dry ingredient bowl. Pour batter into cake pan. Bake for about 50 minutes or until a toothpick inserted in the center comes out clean. Allow time to cool. Invert onto wire racks to cool fully. Beat butter in a stand mixer. Add cocoa powder on a lower level. Combine confectioners sugar, then salt. Add buttercream to the top of the cake with an ice cream scooper. Spread over with an offset spatula. If you're substituting the fudge for a ganache just scald 1/4 cup of cream or milk and pour over an equal amount or semi or bittersweet chocolate chips (or chopped). Let it sit for a few minutes then whisk together. You can add more or less of this into the buttercream It's really up to you! Muchas gracias John por compartir tus magníficos trabajo….. Necesitaría saber qué medidas tiene el molde para hacer el pastel de hoja, si eres tan amable….. Muchísimas gracias!!!!!! Y enhorabuena por tus bellos niños. Is the cocoa powder dutch processed or natural? It depends on the recipe but for this cake I used a dutch processed cocoa powder. I made this cake and it turned out beautifully. I used this morning’s coffee to save time and I crocheted a cake band with cotton yarn to put around my cake pan. It worked perfectly. Thank you. I haven’t made the frosting yet, but I did buy a piping tip so that will be a first for me. Thanks again. I hope you enjoy the cake!! Please please can you but this ingredients into grams specially the butter …..
What size cake sheet pan did you use? The size of my sheet cake pan is 9 x 13! Are you going to try this cake? Let me know how you like it if you do! 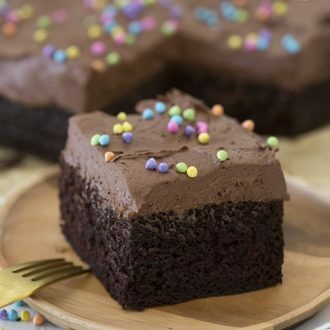 Can you use this chocolate cake recipe into cupcakes? if so how long should I bake it? Made this cake for my son’s birthday. Which fell on Thanksgiving this year. I put your Italian buttercream with the chocolate addition on top. 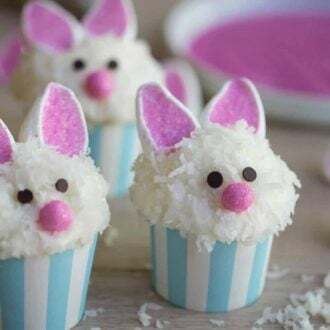 He has one more party to go, and this is what I’m making again tomorrow. Thank you so much. This is now a go-to for me. I wish I could give it bonus stars. Hi John, really like watching your videos. I tried to make this went wrong a bit as I am sure I got the measurements wrong. Like Amal above, I to ask… “Please please can you also add them in grams?” So its easier for those of us who dont use. cup measures. Maybe silky tofu or soaked flax seeds? I’ve made this cake a couple of times. I have only used GF flour, Bob’s Red Mill, because I have a gluten free child. This cake is amazing! We all love it!. I’ll bet it’s even better with gluten!! So easy, so good! Try it! 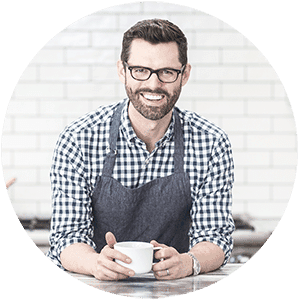 This is the first time I have used your website and a recipe of yours. I made the sheet cake today and although it is delicious most of the middle is dense and not fluffy like the outside. It baked completely (tested with skewer) and even rose high in the middle when I took it out (but went back to normal height when cooled.) I just don’t understand why it was so stodgy in the middle. Only the sides were baked perfectly. Any ideas? Also credit where credit is due, you are such a lovely person and I love watching your videos, your positivity and smile shines through the screen. You really are great to watch. Hope you can help me with this issue as I’d love to make it again! Thanks so much! I saw your post on Insta!I think the cake was not done. Sounds like the center was under-baked. love love love, absolutely the best chocolate cake recipe. I used this for a bday cake and it turned out amazing; First time hit and everyone loved it! Thank you again for posting your delicious recipes!! Keep them coming!! I made the chocolate cake today for hot fudge cake. Excellent, great, fantastic! The coffee makes it more than just a chocolate cake. The batter smelled terrific and tasted better (totally taste tested too much). It is an easy recipe to make no need for a box mix. 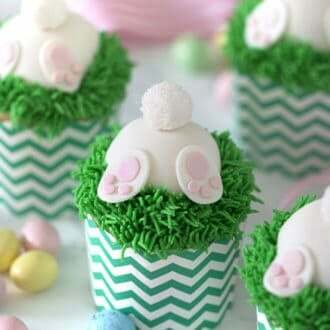 Will try it with the buttercream next time. Thanks for the great recipes! I’m glad you enjoyed this recipe! I agree, I find that coffee only increases the chocolate flavor. Any other substitute for it? Hello! I forgot the brand but you could sub in some chocolate ganache! Thanks for the recipe! I substituted eggs for water and it still worked great for me. Hi John, i‘ve Made this recipe a few times now and ai just love it. I LOVE all your recipes. I would love it if you did a vanilla sheet cake recipe some time as well 😃. All the best, Jennie from @sweetsndreamscakes. My husband is VERY picky when it comes to sweets (he’s not a huge fan of sweets) but I really wanted to try this and it’s a HUGE hit in my house! My kids (obviously) love it and so does my husband so thank you! Hi John, just wanting to know what temperature the coffee should be – boiling hot?